Editor’s Note: Cuban’s intelligence services have long perceived the US as a hapless, bumbling giant. 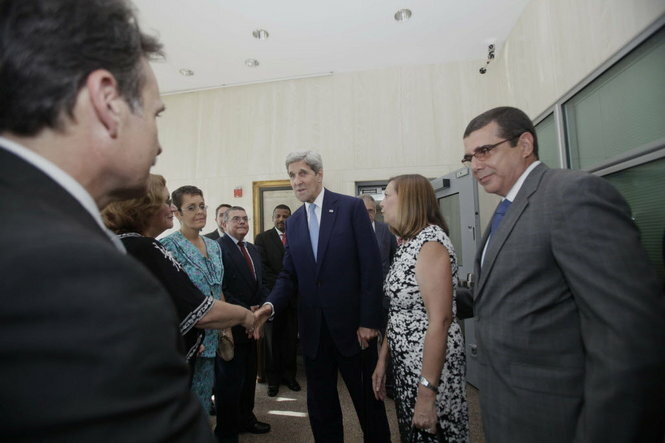 Instances like this – Kerry with career Directorate of Intelligence (DI) officers Gustavo Machin and Josefina Vidal – reinforce Havana’s institutionalized contempt. Machin and Vidal were both thrown out of the US for engaging in espionage against the United States. Granted, Obama administration spokespersons and the mainstream media (but I repeat myself) describe this week’s event differently than does this column title. Something about a “Cuban embassy” formally “opening?” in “Washington, D.C. ?” If I read these things correctly? “Virtually every member of Cuba’s U.N mission is an intelligence agent,” revealed Alcibiades Hidalgo, who defected to the U.S. in 2002 after serving as Raul Castro’s Chief of Staff and himself as Cuba’s ambassador to the U.N. The currently elated Machin was an accomplice of Castro’s master-spy Ana Belen Montes, who today serves a 25 year prison sentence after conviction in 2002 for the deepest and most damaging penetration of the U.S. Defense Department in modern history. Machin was neck deep in the same spying as his accomplice Montes, but enjoyed “diplomatic immunity,” which saved him from prison or the electric chair. Now he’ll probably be visiting Washington D.C. often “on business.” In fact it was Machin who conducted the recent “negotiations” with Obama’s team of crackerjack “negotiators” which led to this “diplomatic breakthrough” with Cuba. So who can blame him for celebrating? 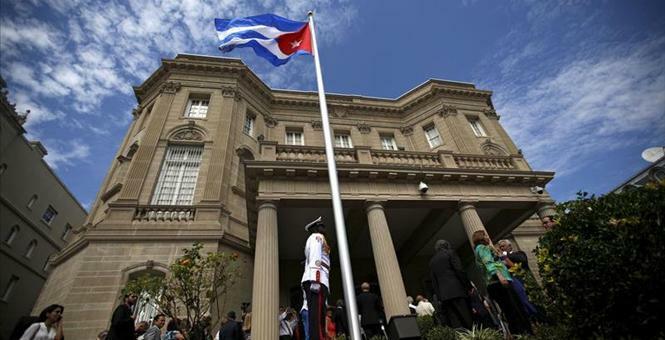 The Cuban flag was raised in Washington D.C. on Monday for the first time in 54 years. When Cuba opened its Washington D.C. embassy yesterday, the moment wasn’t just historic. It also felt really ironic. Historic, of course, because Cuba was raising its flag over the U.S. capital for the first time in 54 years. When the U.S. inaugurates its embassy in Havana on August 14, it will be the crowning moment in the restoration of diplomatic relations between the two Cold War enemies. But this might be a déja vu moment, too, because a big reason the U.S. and Cuba severed ties in 1961 was…embassies. In 1960, Cuban leader Fidel Castro feared the U.S. mission in Havana was a nest of spies scheming to overthrow his communist revolution. “No [foreign] embassy rules our people!” he told the U.N. then. The U.S. was just as spooked about spies inside the Cuban embassy in Washington – especially their close ties to Russian spies. A half century later the U.S. and Cuba are finally mending fences. But what ultimately opened the door to normalizing relations? Trading spies. So the question is: Will the new rapprochement finally build bilateral trust – or will opening embassies, as many security analysts fear, simply give the U.S. and Cuba more opportunities to spy on each other? “It just allows the intelligence services to take their espionage to another level,” says Fred Burton, vice president of intelligence at the Stratfor intelligence consulting firm in Austin, Texas, and a former special agent with the U.S. Diplomatic Security Service. “There’s just a new playground now that has been opened.” Up to now, the U.S. and Cuba have only had “interests sections” in each other’s countries – small, tightly restricted diplomatic missions. Full-fledged embassies will probably mean a big increase in diplomatic personnel – and a much broader range of diplomatic activity and travel. “Every day these brutal thugs continue to repress 11 million Cubans who yearn for freedom and the respect of their basic human rights. But the regime isn’t just a threat to the people of Cuba. They also operate within the United States, with sophisticated espionage, tradecraft, and are allies of our worst enemies”, says Rep. Ros-Lehtinen. “Mr. Speaker, just 90 miles from U.S. shores the most repressive human rights abuses in our hemisphere are being perpetrated by a regime that has shown no respect for human life and that will never change as long as the Castro brothers and their kind remain in power in Cuba. Every day these brutal thugs continue to repress 11 million Cubans who yearn for freedom and the respect of their basic human rights. But the regime isn’t just a threat to the people of Cuba. They also operate within the United States, with sophisticated espionage, tradecraft, and are allies of our worst enemies. We have but to remember the story of Ana Belen Montes. A senior analyst in our Defense Intelligence Agency, Ana Belen Montes was one of the masterminds of Cuba intelligence in the U.S. She was the top spy for the Castro regime and undermined U.S. foreign policy efforts throughout the world due to her nefarious espionage activities. She is certainly serving a long sentence in Texas. But Castro also harbors fugitives from U.S. law, such as Joanne Chesimard. She is a New Jersey cop killer and earned the terrible distinction of being the first woman on the FBI’s most wanted list of terrorists. In 2001, Fidel Castro went to Iran and met with Iranian Supreme Leader Khamenei, and Castro said at that time: Together, Cuba and Iran will bring America to its knees. These are just a few of the examples of why it is imperative for the Obama administration to get tough with Castro, not only to protect our U.S. national security interests, but also to extend a helpful hand to the pro-democracy leaders on the island who are struggling for freedom. The Cuban regime continues to repress independent journalists, human rights activists, and commits arbitrary detentions every day, all to thwart any attempt at the exercise of freedom of expression. I will show you just a few of the names and faces of the voices of those opposition leaders in the push for freedom on the island, and each deserves the attention of this body. Mr. Speaker, this is Berta Soler. 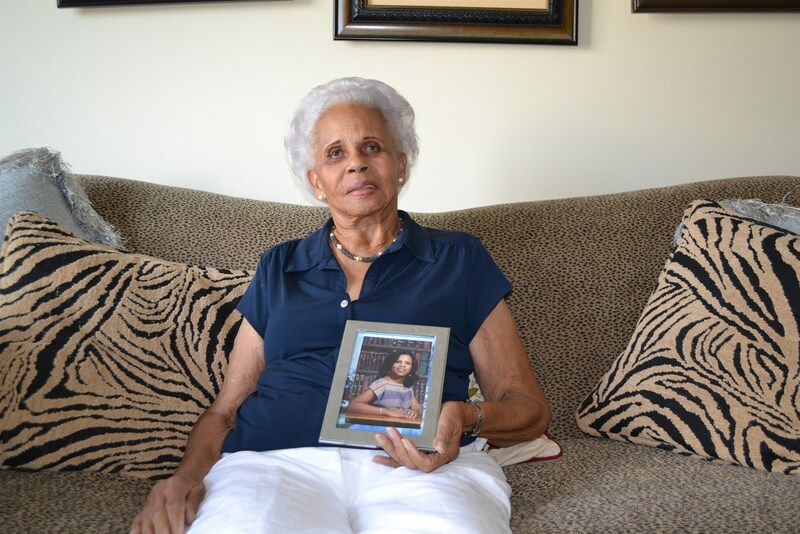 Berta Soler is the leader of a movement called Ladies in White, Las Damas de Blanco, a group of women tirelessly advocating for the release of political prisoners in Cuba. These courageous women walk to mass peacefully holding up flowers and are met with brutal attacks by Castro’s state security. Berta Soler became the leader of this organization after the death of her predecessor, Laura Pollan. Laura Pollan started this movement in Cuba. She died under mysterious causes in October 2011. Many people in the island and outside have blamed the Castro regime for the unfortunate and suspicious circumstances of her passing. We also have many pro-democracy leaders who are still languishing in Cuban jails, and these are some of their faces. This first young man, his name is Angel Yunier Remon. He is also known as El Critico. He is another face of repression on the island. Angel was arrested in March for criticizing the Castro regime’s brutal human rights abuses and the oppression of 11 million of his fellow countrymen. To this day, El Critico remains in prison for the mere crime of simply expressing his right to address grievances through rhyme. Then there is the face of Sonia Garro. Sonia is another member of the Ladies in White. Sonia and her husband were arrested 2 years ago in a violent raid. Her trial has been suspended four times without an explanation or any reason being given. Along with Sonia, fighting for the causes of freedom and liberty is this young man, Jorge Luis Garcia Perez, better known as Antunez, who has been in prison in Castro’s gulag for nearly 17 years. Antunez and his wife, Yris, have repeatedly been assaulted and beaten by state security forces, and their scars tell a story of resilience and commitment to the cause of freedom on the island. They are free now, but one does not know for how long. Lastly, Mr. Speaker, there is the case of Juan Carlos Gonzalez, another freedom fighter I would like to highlight. He is a lawyer who is blind. He has spent years defending the human rights of the Cuban people. Stephen Purvis has returned to Britain after spending 16 months in a Cuban jail on false spying and fraud charges. He speaks to Colin Freeman about the ordeal. WHEN the £400 million Bellomonte Golf and Country Club eventually opens for business, its pristine fairways will mark an elegantly-landscaped route for Cuba to move into the 21st century. In a country that once banned golf as a “bourgeois sport”, its five-star hotel, spa and luxury villa complex is the clearest sign that the Communist outpost is finally embracing the long-taboo ethos of capitalism. One man who is unlikely to attend any future ribbon-cutting ceremony, though, is Stephen Purvis, the Wimbledon-born architect whose firm, Coral Capital, was behind the Bellomonte development. Resident with his family in Cuba for ten years, he was the ideal person to mastermind the flagship project of its tourist economy, having previously turned Havana’s crumbling, colonial-era Saratoga Hotel into a chic hang-out favoured by the likes of Beyonce and Naomi Campbell. Last week, though, he was recovering back in London, after losing 16 months of his life – and 50lbs in weight – to a stint in the rather less comfortable accommodation of Cuba’s prison system. In an ordeal that could have been torn from the pages of a Graham Greene novel, Mr Purvis was falsely accused first of being a spy, and then of obscure breaches of finance laws, while never being told details of the allegations against him. He fled the island after a court released him a fortnight ago, following a trial conducted entirely in secret. Meanwhile, Coral’s offices in Cuba have been shut down, and the country club project in which he has invested millions of pounds and five years of his life handed to a Chinese firm. Yet he counts himself lucky. During his time in Havana’s notorious Villa Marista spy interrogation centre, he feared he might never see the outside world again, or his wife Rachel and four children. Mr Purvis, 52, spoke out last week to warn other British entrepreneurs of the risks in Cuba, which has courted foreign investors in recent years to revamp its moribund command economy. They were risks, though, that he himself thought he no longer had to worry about, given that his own firm, financed by private European backers, was among the best-established on the island. Since setting up there in 2000, it has invested in everything from tourism through to factories and docks, and even financed El Benny, a Cuban film about the country’s most famous singer, Benny Moré. Mr Purvis was also a pillar of Havana’s expatriate community, working as vice-chair of Havana’s international school, where diplomats sent their children, and producing “Havana Rakatan,” a Cuban dance show which has toured London’s West End. His connections, however, counted for nothing when in October 2011, Cuban police arrested Coral’s British-Lebanese chief executive Amado Fakhre, on charges of bribery and revealing state secrets. The move appears to have been part of a wider sweep against dozens of foreign businessmen, launched after Cuban intelligence – which still views capitalism with suspicion – became convinced that the occasional bribes which took place had become an epidemic. Brazil – (Agence France-Presse) – Visiting Cuban Foreign Minister Bruno Rodriguez said Monday that Cuba was ready to open talks with the United States on swapping their respective nationals held for spying. Speaking to reporters after meeting his Brazilian counterpart, Antonio Patriota, Rodriguez referred to US contractor Alan Gross, who is serving a 15-year prison sentence in Cuba, and of Cubans convicted of espionage in the United States. 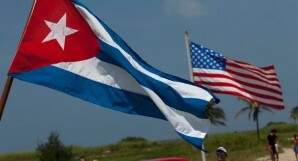 “Cuba has signaled to the United States its readiness to open serious, respectful talks, taking into account humanitarian aspects, to try to find a solution to the case of Mr. Alan Gross and also taking into account reciprocal humanitarian concerns in the case of the other Cuban citizens still detained in the United States,” he added. “Gross was sentenced for violating Cuban laws as agent of a foreign power who tried to set up (spy) rings with use of non-commercial technology, military technology for avoiding satellite signals, to change the constitutional order of our country,” the Cuban chief diplomat said. Gross, 64, was arrested in December 2009 for distributing laptops and communications equipment to members of Cuba’s small Jewish community under a State Department contract. Rodriguez was queried about Gross after a Florida federal court last Friday ruled that one of five Cubans convicted of spying in the United States would be allowed to remain permanently in Cuba in exchange for renouncing his US citizenship. Rene Gonzalez, 56, who was on probation in the United States after serving 13 years in prison for espionage, has been in Cuba since traveling there to attend the April 22 burial of his father. Gonzalez was arrested in 1998 along with the other members of the Cuban Five group — Gerardo Hernandez, Ramon Labanino, Antonio Guerrero and Fernando Gonzalez. The five men were found guilty in 2001 of trying to infiltrate US military installations in South Florida and were given long prison terms, ranging from 15 years to life. Gonzalez was released from prison in October 2011. 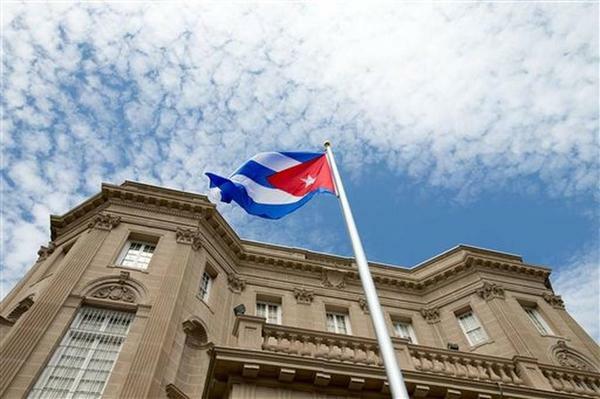 Cuba has admitted that the five were intelligence agents but says they simply aimed to gather information on “terrorist” plots by Cuban expatriates in Florida — not to spy on the US government. A United States diplomat will be expelled from Venezuela within 24 hours for plotting against the government, Vice President Nicholas Maduro has said. In a live address to the nation on Tuesday, Maduro said the US embassy military official was being expelled from the country for seeking out active Venezuelan military officials to propose “destabilisation projects.” Maduro identified the Amnerican as the Air Force attache and said he had been spying on the military. US Embassy spokesman Greg Adams identified the attache as David Delmonaco. Listening to the endless special pleading on behalf of Jonathan Pollard, one would think he was an innocent man, wrongly accused, wrongly convicted, wrongly imprisoned. In fact, Pollard spied against his country. If his sentence is excessive, it is clear that the reason is the US wants to make an example out of him, to send a message to Israel: Don’t look your gift horse in the mouth again. If Pollard’s sentence is excessive, it is matched, and more than matched, by the incessant lobbying on his behalf by countless Jewish organizations, whose statements acknowledging the seriousness of Pollard’s crime are weak and even insincere in this sense: Alongside the acknowledgement of espionage is this disclaimer, “Well, it really wasn’t so bad, since Pollard was, after all, only spying for an ally.” As if it were guaranteed that the information Pollard supplied to Israel never ended up in the hands of America’s worst enemy at the time, the USSR. The pro-Pollard lobbying efforts have the effect of crying wolf. When a genuinely innocent American Jew is imprisoned, who in the upper echelons of the US government is listening hard enough to do anything on behalf of Alan Gross? Gross is wrongly accused, wrongly convicted and wrongly imprisoned by Cuba. Gross’ crime, such as it was, was to show the local Jewish community how to use computers; and this, while Gross was under contract with the US Agency on International Development. Gross was not spying against the US or, for that matter, against Cuba. He was an innocent expert doing his job for the US, neither intending nor effecting any harm against Cuba. Meanwhile, Gross is suffering medically, he is denied medical care, he is wasting away. He is worthy of our outrage, our protests, our demands for his freedom. He is living a nightmare, as is his family. He deserves to be released. And our voices deserve to be heard. They are, we fear, drowned out by the Pollard lobbying, which has this effect: Here come American Jews again, seeking benefits for one of their own — one who doesn’t deserve it. José Antonio Torres was charged after writing about mismanaged public works project. A journalist with Cuba’s Granma newspaper was sentenced to 14 years in prison for spying, a charge filed soon after he reported on the government’s mishandling of a critical construction project, according to dissidents. José Antonio Torres was the correspondent for Granma, the official publication of the Central Committee of the ruling Communist Party, in the eastern city of Santiago de Cuba, the island’s second largest. Arrested in February 2011 and tried around mid-June, he was sentenced more recently to 14 years in prison and the suspension of his university degree in journalism, said dissident José Daniel Ferrer Garcia. Cuba’s government-controlled news media has made only a few brief references to the Torres case, despite his well-known reporting and the charge against him. Only about a half-dozen Cubans are known to be jailed on spying charges. Ferrer, head of the dissident Cuban Patriotic Union, said he received information on Torres from government opponents jailed in the same prisons on the outskirts of Santiago, at first Aguadores and more recently Boniato. “We know he appealed the 14-year sentence but fears a worse outcome” because the appeals court could increase it, Ferrer told El Nuevo Herald by phone from his home in Palmarito de Cauto in Santiago province. Prosecutors sought a 15-year sentence. The postscript also praised Valdés for his handling of the project, even though the two men reportedly clashed often in the 1960s and 1970s, when Castro was minister of the armed forces and Valdés was minister of the interior, in charge of domestic security. Torres may have kicked up more dust four months later when he wrote about the fiber optic cable laid from Venezuela to Siboney Beach just east of Santiago. He noted that Valdés, at the time minister of communications, was supervising that project. Several ministry officials were arrested later on corruption charges apparently linked to the cable. Valdés was promoted out of the ministry in early 2011 to an at-large job supervising the ministries of communications, construction and hydraulic resources.